How to Cook Ham - Recipes That Crock! Wondering how to cook ham? 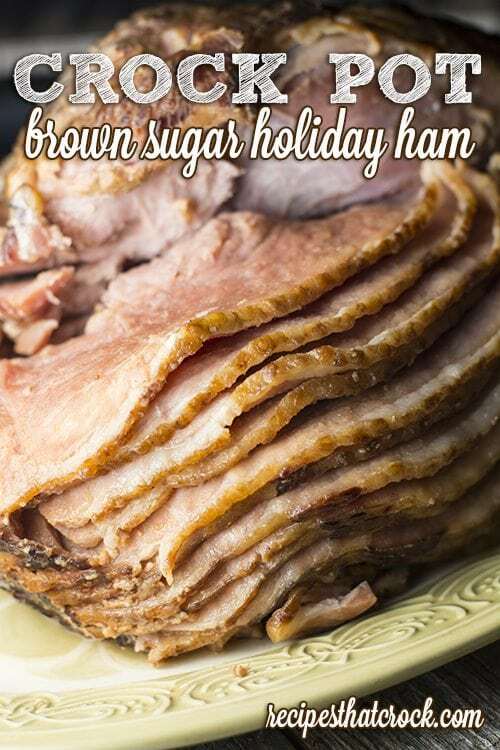 This Crock Pot Brown Sugar Holiday Ham recipe is one of our very favorite ways to make a fail-proof holiday ham that will knock their socks off. Both spiral and regular cooked hams come out super flavorful, tender and juicy with this crockpot-baked ham recipe. Slow cookers are just perfect for those who find themselves wondering how to bake a ham. Crock pots tend to keep moisture in a lot better than ovens, so cooking ham in a crockpot has a lot of advantages, especially for first time ham-bakers or those who are just simply looking for an easy way to bake ham. Note: We recommend that you use bone-in spiral or traditional hams or whole muscle boneless hams in the slow cooker. Reconstituted hams do not typically do well in the slow cooker for long periods of time. UPDATED: We have updated this post with a video tutorial on how to cook our favorite crock pot ham recipe. I found this recipe in Gooseberry Patch’s new Hometown Christmas. This recipe is by far the easiest most flavorful ham I have ever personally made. It was incredibly tender and juicy and it literally took 5 minutes to throw in the crock pot! (Note: If you don’t have these ingredients on hand, you can also try our Easy Crock Pot Ham. Now most of the time I prefer a basic bone-in cooked ham versus a spiral ham. I think it is nostalgia more than anything. However, I have used this recipe multiple times for both types and I have to say this last spiral ham we made in the crock pot was so incredible it might just begin to change my mind on the whole matter! Regardless of what type of ham you choose, there isn’t an easier way out there to cook it than in your slow cooker! Fail proof crockpot ham recipe. Perfectly tender, flavorful and juicy every time! Place ham in a large slow cooker flat side down. Rub brown sugar over all sides of the ham. Drizzle with juice and syrup. If you are looking for more ham recipes, you can find a full listing of all our holiday ham recipes here. You will need to pick out your ham to fit inside your slow cooker or cut it down to fit. We typically try to find a 6-7 lb ham that is the right shape for the 6-8 quart slow cooker we are wanting to use. If your ham is just a little too big to get the lid on tight you can wrap aluminum foil around the outside of the lid to keep the heat in. We use a fully cooked ham in this recipe. Check your ham's packaging to see if there are any specific temperatures your ham needs to cook to per the brand's suggestion. If a specific temperature is necessary, we love using this meat thermometer while we crock pot cook. We love that you can leave the probe inside the slow cooker and it will ring an alarm when the ham reaches the correct temperature. Cooking times will vary GREATLY on this recipe depending on your ham size/shape and how hot your slow cooker cooks. Check it regularly to make sure that you do not over cook your ham. All slow cookers cook differently, so cooking times are always a basic guideline and should always be tested first in your own slow cooker and time adjusted as needed. When purchasing your ham, keep your crock size in mind. It is important to consider both ham shape and size. Picking a ham based purely on weight can lead you to an odd shaped cut that won’t fit your crock pot. You will want to make sure your ham can fit entirely inside of your slow cooker with the lid completely closed. Many models of slow cookers these days come in 6-7 qts offering ample room for a nice-sized ham. This 7 lb ham fit nicely in my 6 qt slow cooker. Hi I was wondering if I can cook my ham on high for a shorter cooking time? If so how long would the time be? Can I use a smaller ham with this recipe? I bought a 2.59 lb ham. Chris: I made this last night and it came out GREAT, just like all the rest Recipes that I have tried. Keep up the great work and again thank you. So glad to hear you enjoyed it, Neil! Great idea Anita! Merry Christmas! Hello, I’m in Aus & don’t know wat a spiral ham is! Can I please use a shoulder or leg ham thats already cooked from the supermarket? Do I take the rind off and then cook the ham with ham ‘fat’ side lying on the botton of the crock pot or at the top under the lid? Sorry to sound silly, but I’d love to make it but never done it b4. I would cook it with the fat side up. Enjoy! Hi Kellie- After it cooks down it doesn’t maintain a distinct pineapple taste. The juices are very savory. You can try apple juice as I know others use it. I have heard it will be a bit sweeter though. Enjoy! Any suggestions if I forgot pineapple.? Hi Susan! We haven’t tried it, but I have heard some folks use apple juice. I would imagine that would make it a bit sweeter though. Sounds good Lorraine! You may want to substitute your whiskey for half a cup of the pineapple juice instead of just adding it in addition to. Those cloves sound so good! I love the flavor of cloves with ham! Merry Christmas! Hi Judy! Cook on low 🙂 Merry Christmas!! It sounds like you may have started out with a ham that was processed quite a bit. Those may be okay to slice up for lunch meat and such, but I would steer clear for your feast next week. Did it happen to have a cut side to it where you could see the ham or was it all encased? My guess is it was likely encased. For that traditional ham you are going to want to go with a bone-in variety to be sure you are getting what you want or, if you go the boneless route, look for “whole muscle” on the label. Spirals turn out great in the slow cooker, just turn them cut side down so the juices can keep them from drying out. Don’t be afraid of a “cooked” label. I believe all”smoked” hams (what we think of when we say ham) are technically cooked. Some require more cooking while others you are simply reheating. Fresh ham (uncooked) will cook up more like a roast and turn white. This just looks amazing, I know we’re going to have to make this for Christmas this year! This was so delicious, I will do my ham this way from now on!! Thanks for the wonderful recipe!! We just love this method! is that 6 to 8 hrs high r low setting?